Biblical Institute graduate Lorena Martínez López of Our Lady of Guadalupe in St. Paul receives her diploma after being greeted by Bishop Andrew Cozzens July 26 at the Cathedral of St. Paul. 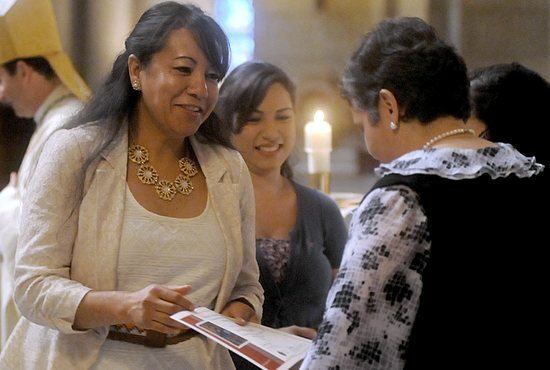 Bishop Andrew Cozzens celebrated the graduation Mass July 26 at the Cathedral of St. Paul for those completing the three Latino ministry formation institutes offered in the Archdiocese of St. Paul and Minneapolis. The Catechetical Institute (modeled after the Archbishop Harry J. Flynn Catechetical Institute), Biblical Institute and Pastoral Leadership Institute are programs of the archdiocese’s Latino ministry outreach that help parishioners grow in their faith and emerge as leaders to work and volunteer in parishes. Alma Valle Miranda of St. Stephen in Anoka greets Bishop Cozzens as she comes forward to receive her diploma from the Leadership Institute. “This leadership program helped me to give to the service of my parish, to prepare me to be a better leader in the image of Jesus Christ,” said a graduate of the Biblical Institute. The programs have grown since they were first offered. The Pastoral Leadership Institute has been offered since 2002; this is the sixth graduation, said Estela Villagrán Manancero, who serves in the archdiocesan Office of Parish Services with Latino ministry. “All of our graduates are working as staff or leading a ministerial group at our parishes,” she said. 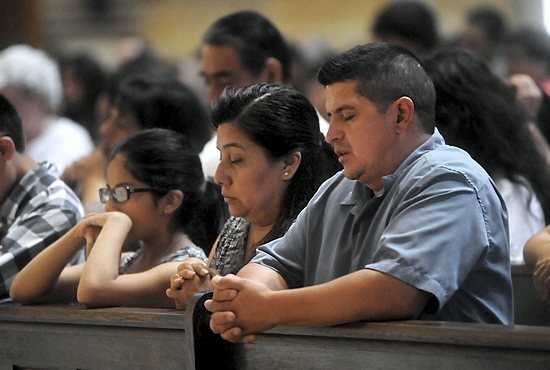 Carlos Rojas, right, and Gloria Sánchez of Sagrado Corazón de Jesús in Minneapolis pray during the graduation Mass. Rojas graduated from the Catechetical Institute. The two-year Catechetical Institute and the Biblical Institute were added as a result of the archdiocese’s 2010 strategic plan. “These classes have helped our leadership to do a better job in evangelizing, and deepened their faith and understanding of the Catholic Church,” Manancero said.